Through your gifts you and I together are loving people to life. My message this month deals with the forgotten dynamic of praise and thanksgiving. The Bible is full of praising people – not just saying praise words but entering in to the culture of the Trinity and the unlimited love-power that flows from that. We spend a lot of time asking for things that we should be using to be engaged in praise. This message could open areas of your life that will be transforming to your walk in Christ. We are rapidly approaching our retreat the second weekend of December at the Inn of the Hills in Kerrville, Texas. If you are still planning to come you only have a few days before the special rate at the hotel closes. You must have registered by November 15th to have the retreat rate on your room. Every year we have people at the retreat that cannot pay but have a great need to be there. Each year these are sponsored by partners who cannot be there themselves but pay for another to go instead. If the Spirit urges you to be one of these sponsors call our office and let us know that you want to be the grace of God in another’s life by paying for them to be there. Many have given such gifts and brought blessing and transformation to one in need. 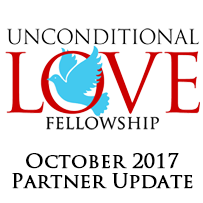 If you have not yet visited our Unconditional Love LLC page on Facebook take a look – there are thousands who are visiting and inhaling those messages of grace and love. We also have a group page on Face Book called “Love in Action Group” and we are receiving new members every day. Thank you for your gifts you send every month that enable us to continue sharing the life transforming news of the love of God. I say it often – but it is absolute truth – your giving is not merely dollars to support an organization. Every dollar that you send is the love of God clothed in finances and wrapped in prayer – the gift of your life joined to the Holy Spirit and sent forth to world. You and I, along with every other partner do more together than either of us could do alone in our wildest dreams. In your monthly giving you are part of my voice carrying God’s love in Christ in the power of the Spirit to the world. Download this month’s MP3 Here or Click Here to listen to it streaming online.